Introducing "Jai Durga Sweets", as the top grade manufacturer, supplier of Soan Papdi and Kaju Katli, Established in the domain since 1983. With about three decades long experience we are known in the market for offering delicious Kaju Katli, Elaichi Soan Papdi and Orange Soan Papdi. Being a thirty three year old entity, we specialized in the orbit of making sweets with chocolates, pineapple, orange elaichi and kaju. All these are super delicious in flavor in order to maintain their quality we store them at a secured place to maintain hygiene and purity in them. We work for the satisfaction of our clients hence made these sweets with the high quality raw products. Also, we deliver these products to clients end in appropriate manner by sustaining optimum standard at the time of their packaging. We have marked our presence in the entire nation and our client base appreciates us a lot for offering delicate sweets in awesome flavors. Apart from high standard of quality we offer these sweets at most appropriate prices that keep us ahead in the market. All the provided range is procured at our base which is laced with all the required cooking tools & equipments. Also, we have best expert of industry working with us, which are capable to make variety of sweets with an ease. We do offer these products in different quantities as per the variegated needs of clients. Moreover, sweets made by us have high nutrient value, long shelf life, edible quality and hygiene. 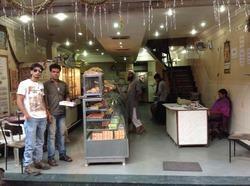 "Mr. Basant D. Gupta", (Partner), is a professional of sweet industry, who has supreme knowledge of domain. In his supervision, we have made best possible efforts to assure top quality standards in provided range of sweets. He is the most respected person of domain who knows very well how to manage tough competition & smooth functioning of business. Manufacturing and Trading of Soan Papdi And Kaju Katli. The credit for our success goes to our highly skilled and experienced team of workers who make every single effort to deliver impeccable range of sweets in variety of flavors. We have hired skilled workers that work with all of their energy and efforts towards achieving of the firm’s objectives. Also, this team for the purpose of better management has been sorted into a number of units. The units are formed based on the proficiency of workers. For our firm quality is given maximum importance hence the offered products are manufactured in accordance with the industry set norms and guidelines by skilled workers. Also, for the quality manufacturing of sweets all process is done in a careful manner utilizing the finest raw materials and sophisticated equipments. With all these facilities, the offered product has delicious flavors, fine finishing and a commendable texture. Post packaging, the offered range is sent for quality check which is done by skilled team, who scrutinizes the products for elimination of defects. We are known to be amongst the finest manufacturers and suppliers of a diverse range of sweets. For the purpose of stand high on market standards, manufacturing of this range is done by utilizing the finest quality of raw materials, in accordance with the needs of customers. Owing to these features, the offered product is high in flavors, hygiene and has a higher demand in the market. Further, these products are priced reasonably, packed commendably and are delivered on a timely manner. At our base, we have maintained ultra-modern facilities for the ease and comfort of customers. The provided facilities are praised for the superior ease and efficiency it provides. For the purpose of prevention of damage, the prepared range of sweets undergoes regular quality check. This quality control facility is managed and maintained by some of our highly skilled workers. The facility has been designed in a manner, which ensures its protection from rain, fire and various other natural calamities. Further, the facility is upgraded on a regular basis, to stay ahead of our competitors.